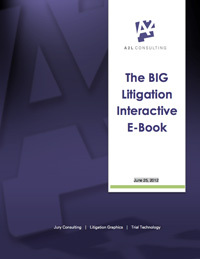 A2 Consulting is proud to release its largest e-book to date – the BIG Litigation E-Book for Litigators and Litigation Support. With more than 75 pages of specific, litigation-focused content drawn from actual trials, this book contains a wealth of valuable information for any litigator. While the book is geared toward litigators trying big cases – those with $10 million or more at stake – there is something here for all litigators. We think it’s invaluable for anyone who is conducting a trial before a jury or judge, in federal or state court. In more than 25 articles, the courtroom experts at A2L cover such topics as storytelling for litigators, mock testing of litigation graphics and arguments, making great opening statements, researching your judge, preparing timelines, and working with the difficult expert witness. The e-book is completely free to download and can be downloaded here. -- Printed Trial Boards Making a Comeback? It's Courtroom Deja Vu!